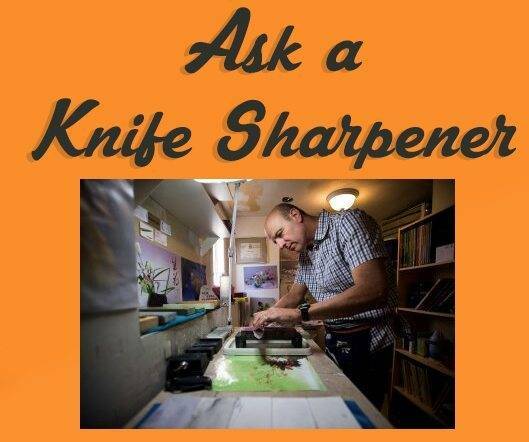 Here’s Peter Nowlan answering some common knife sharpening questions. Do you strop your knives on leather or another medium after sharpening? Sometimes but not as a general rule. I have used leather strops laden with various compounds and sprays and also bare leather. I sharpen a lot of knives, I found the leather became gritty with the compounds and I kept tearing them through carelessness. If I do strop, I use a finishing stone, either 13,000 or 16,000 grit with water on the surface. I do this to ensure the edge is clean, free of any debris left over from the sharpening process . I use very light trailing strokes with a lot of focus and attention to my angle which is the same as the sharpening angle. How do you test your knives for sharpness? I use a variety of methods depending on the knife and it’s destination after I’m done. For general use, i.e. at home, I test the edge by visual inspection and by touching it with the pads of my fingers, which must be dry. if the edge grabs, I know it is sharp, I can feel it. Other times, I will use telephone book paper, never photocopy paper which is too thick and in my opinion not a great test. I will try slicing the paper and also push cutting the paper. If I know the knife is going to professional chef, I do these tests but I will also test the edge on a ripe tomato. I also quite often test the edge on my arm hair, but you need to be careful of course. I think any one of these tests will suffice. if the knife was challenging to sharpen, i.e. old and thick and perhaps abused by overuse of a Steel then I will do one or more of these tests to satisfy myself that the job is done the way I like it. What’s the most important Water Stone in your lineup? 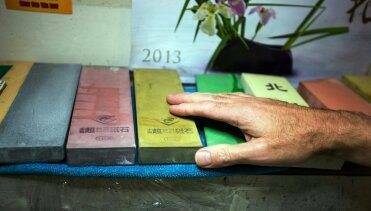 For me the coarse stone is the foundation of my sharpening regime. It is quite possible to make a knife extremely sharp with a 400 grit or 500 grit stone. (It is possible as well to make the knife sharp with a 150 grit stone). After a lot of experimentation, I’ve determined that time spent on a coarse stone is time very well spent and I make sure the knife feels very sharp prior to jumping up in grit. Variances in pressure is the key here, I also use three levels of pressure, Heavy pressure to get the process started, to remove the fatigued metal, set the bevels and sharpen the knife. I then repeat the process with the same stone using Medium pressure. This is quick step, the majority of the work is done, now I am fine tuning, coarse refinement and finally I use Light pressure, just enough to control the knife. This happens quickly and results are quite pleasing. How do you flatten your water stones and how often do you do this? I use an Atoma 140 diamond plate. I place a grid on the surface of the stone with a pencil and run the plate over the lubricated stone in a circular motion and also straight a back and forth motion until the pencil marks vanish. I turn the stone around in the holder during the process as well. I use the Atoma 140 for all stones but I have a well worn water stone that is more gentle that I use on water stones 6,000 grit and above. The coarse stones are the ones that require more frequent attention and I follow my flattening process after three or four knives. There are other flattening products available including the excellent Diamond lapping plate made by Shapton. I believe this is the premium flattening product but I have not used it. It is very important to keep the stones flat and if you sharpen a lot, do it often, before the stones “dish” in the centre. Use very little pressure when flattening, it is not necessary to press down hard at all. When I am done I chamfer the edges of the stone with the plate by holding it at a 45 degree angle and running it over the edges, all four sides, it is a very quick process. How do you feel about sharpening angles and their importance? Folks who sharpen knives should of course realize that the angle that is chosen to sharpen a knife will have an impact of the performance of the knife. If we sharpened a regular chef knife at an angle of 35 degrees per side, that obtuse angle cause the knife to perform terribly in the kitchen, despite how sharp the knife is. Remember that we can make a knife sharp at 35 degrees, the primary edge can still be sharp but the resultant edge would be so wide that cutting a carrot for example would result in the carrot just breaking. For those who freehand sharpen, we do our best to determine if the sharpening angle is 15 or 17 degrees, we are free handing so unless we have a device that measures angles we go by best judgement, practice and logic. Yes there are products that measure angles and we can use math to determine how high to hold the spine of the knife off of the water stone, 0.5 inches for example or 12 mm but we still have to hold the knife at that angle while sharpening. I can have a team of scientists tell me exactly how high to raise the spine of a 2.5 inch wide knife to achieve a 12.5 degree angle. However, I need to move that knife over the stone to sharpen it… those scientists will be in the way. Here is the key: Don’t fret over the exact angle, logic will guide you and you will know that you shouldn’t sharpen it at 40 degrees per side for example. You must focus on holding the knife at your chosen angle while you sharpen, whether the angle is 15 or 22 degrees, you need to develop consistency and hold your angle as you move the blade over the stone from tip to heel and on BOTH SIDES. Is anyone going to be able to know if you sharpened it at 16 degrees rather that 15? I doubt it. However if you sharpened one portion of the knife at 16 deg and another portion of the knife at 22 deg you will know, you will be able to see it. Instead of being afraid to even attempt to sharpen a knife because you don’t think you can stabilize an angle, instead, concentrate on holding any angle, (common sense applies here of course), let the Sharpie’s visual clues help you, don’t even think about a number, think about “steady”. Passion, Persistence, Practice, Patience… those should be your angles.